Holidays in Santa Teresa Gallura take you to northern Sardinia’s wild and rugged coastline. Here you’ll find pristine white sandy beaches, crystal clear waters, bright underwater corals and easy access to the uninhabited Maddalena islands. Couples will enjoy spending time immersing themselves in the laid back atmosphere of the area, with excellent cuisine and plenty to be explored. The pretty town of Santa Teresa Gallura is home to colourful pastel buildings which contrast with the natural backdrop of sparkling blue seas and emerald green hillsides. Inside, you’ll find family run restaurants with al fresco terraces, street side cafés and little shops where you can pick up local handicrafts. When it comes to beaches you’ll be spoilt for choice. To the north is Rena Bianca Beach where you can relax on the sands or take in views from Longonsardo Tower which watches over the coastline from above. In the east you can make the most of little bays and watch the yachts as they bob on the water. 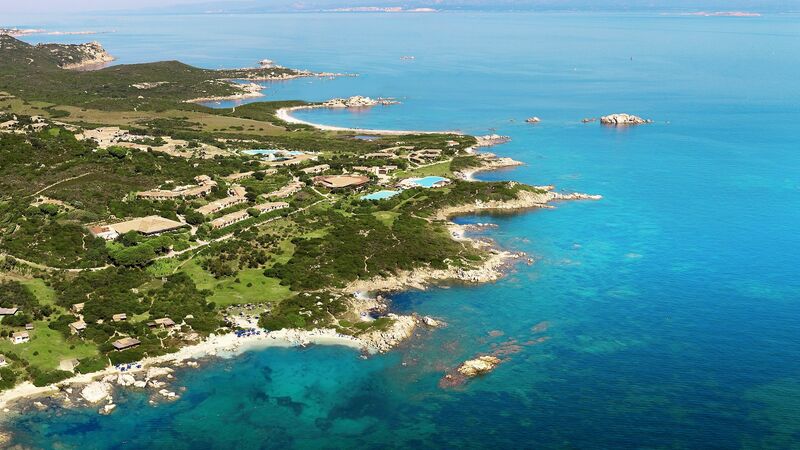 Luxury holidays in Santa Teresa Gallura bring you a relaxing and tranquil break in Italy’s warm and sunny Sardinia. It’s ideal for couples wanting to get away from it all, with cobbled streets and quiet beaches. For the ultimate in serenity book a boat trip to one of the Maddalena islands, which are located just off the coast. You’ll find deserted landscapes and soft beaches where the only footprints in the sands are your own. Take a picnic and spend the day soaking up the sun in your very own slice of paradise. Choose Sovereign for your luxury holidays in Santa Teresa Gallura and you’ll soon find yourself immersing yourself in the laid back atmosphere of Sardinia. We’ll take care of even the little details so you can simply relax. Stay at the Resort Valle Dell' Erica Thalasso & Spa and enjoy views over the green dunes and white sandy beach to the spectacular sea behind. The interiors are bright and spacious, while the gardens boast pretty flowers and lagoon style swimming pools, with the main infinity pool providing magnificent views of the coastline. Santa Teresa Gallura sits on a rugged coastline where sand is scarce – which makes sandy Rena Bianca Beach the town’s surprise jewel in the crown. It’s a Blue Flag beauty, too, with 200 metres of pristine powder and sunloungers, plus a bar serving seafood salads and chilled wine. Fancy a bird’s-eye view of scene? Head up to Longosardo Tower, which roosts on the rocky headland next door. It’s only a five-minute walk away, but serves up the best sunset views in Santa Teresa Gallura. Transfer time from Olbia airport to Santa Teresa Gallura is approximately 1 hour.